The analysis is extremely poor. You should not be looking at the average data rate when testing multiple transfer sizes because the difference between 4KB and 1024KB transfer speeds is close to tenfold. OWC's testing is also fairly bad because they only ran the standard suite, which tops out at the IO size of 1024KB and thus cannot take full advantage of the drive. 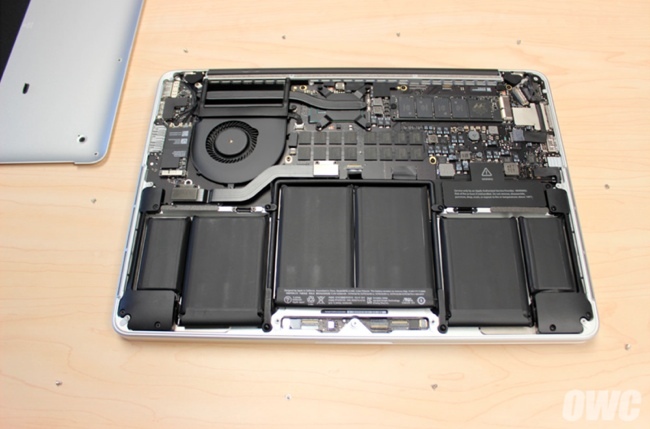 The SSDs are the same as in the original Haswell rMBP, so to be honest there is nothing to see here. Bad tests and even worse analysis are just confusing everyone now. I didn't realize how much MR dropped the ball on this one until I clicked over to the OWC article. Besides MR listing the average speed instead of the top speed (OWC just posted the screenshot and didn't single out the pointless "average" number), OWC has two more tests for each drive with larger file sizes and much higher numbers. Top numbers were actually 791 read 744 write for the 256G and 762 read 454 write for the 128G. Those are really good numbers, faster than any SATA drive can handle and I suspect comparable the previous generation of these machines if not a bit faster. Really misleading spin by MR, you guys really should correct your article as you give the opposite impression of what the actual speeds of these drives are. FYI, OWC updated its original post several hours after it posted the first two tests, which were the only available at the time. I've updated the post based on your feedback and the new tests. Even the 120gb 840 evo has up to 540MB/s reads and 410MB/s writes. You're comparing the highest numbers ("up to") with average numbers, did you even look at the full chart of numbers in this article? Top read/write numbers for 1028k were 584/566 on the 256 and 593/438 on the 128. All of which are higher than the EVO numbers you listed. Not to mention that 1024 is a low number to top out at, with a benchmark that goes up to bigger chunks you're likely to see even higher results. Honestly I've never seen an "average" number for SSD benchmark before, it's flat out meaningless unless you directly compare it to other drives running the same benchmark and also generating that same average. As another data point, here is my BlackMagic test of the new version 128GB 13" Retina I picked up yesterday. This is with Filevault on. Thank you. That makes much more sense now. Shame on MR for the very misleading spin. :( I pretty much knew this already, but this looks like it seals the deal. Apple will produce a computer with a joke of a cpu, totally inadequate memory, an absurdly small amount of file storage, not upgradeable and not repairable, BUT they draw the line at a display that isn't magnificent. Or at least I've been told it's magnificent, because I wear glasses and can't see any difference. The ability to trade off the performance of various subsystems to lower the price to something that a particular user can afford ended with the Ivy Bridge. At least if the particular user is a software developer who needs to run and test big cpu-intensive programs. I guess I'm the only programmer left who wants to buy an Apple laptop, or at least the only programmer without a trust fund to waste on completely unneeded pretty things. What laptop, exactly, are you talking about? Because it seems like you are either A) confused or B) know very little about the laptop market. Just because you have poor vision doesn't make the Retina display useless for everyone else. It's a gorgeous display. And it's a very thin system with tight power and thermal constraints, so it's not like Apple could throw in dual SLI titans or a 12 core Xeon...try finding a cheaper laptop, with equal build quality (ie. not plastic), with a retina display, and equal specs at the same price range. I wish you the best of luck with that. It seems like you're one of those people who think Apple shouldn't care about making it thin and throw in max specs instead. But I'm certain that if they had done that, you would post on here shrieking "but it's so thick!" You can criticize the machine, but there comes a point where it becomes more of a matter of opinion than anything else. I am a programmer myself and I have found the retina MacBook Pro to be an invaluable computer, it is still screaming fast after 2 years. The SSD in the Pro will look like this. The one in the Air is a small "blade" style module like this. They are not interchangeable at all. Because it's an extremely small refresh, nothing special at all. I hope it doesn't take another year for a refresh. I am on a mid 2010 MBP and I'd like to upgrade soon.